My name is Miss Maria and I'm the EDB NET teacher from Vancouver, Canada. It has been a rewarding journey teaching in LCPS for the past years. I am very fortunate to be a part of this team and to co-teach with such experienced English teachers. Teaching is an absolute passion of mine! It is my mission to instill the love for learning in my students. 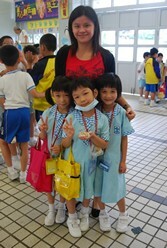 I hope my students can love to speak English in their daily life and develop a desire to become lifelong learners. I hope to get to know each and every one of our students. Please feel free to come and speak to me in English! See you around school! Hello, my name is Mr Inder. I am an energetic teacher who strives in providing an energetic and creative learning environment that is stimulating for students to nurture their abilities. I love the opportunity to teach children. I am genuinely passionate about education and I believe that children deserve the right to learn in order to achieve their future goals and aspirations. As such, I hope to light the spark in all students and push them towards greatness and success. I also love talking and sharing ideas so please feel free to come and talk to me. See you soon! Hello! My name is Miss Phyllis and I’m the English Language Teaching Assistant (ELTA) at LCPS. I love children and my career is dedicated to teaching them. Children are like pieces of paper, they await us for the colouring of knowledge and experience. Teachers play an important role in what is written on this paper, for better or for worse. I see it as my life-long responsibility to ensure good contents are written at all stages of development. Aristotle once said: “The roots of education are bitter, but the fruit is sweet.” Indeed, I believe education can help children pave a better way. Although sometimes the process of learning is exhausting, knowledge is of the utmost importance since it is the only asset that cannot be taken away once it is acquired. I aim to help students along this path and assist them in shaping the persons they aspire to become. I also aim to enhance students’ initiatives towards learning English through a variety of activities. Don't be afraid of making mistakes when you speak English. Feel free to come and chat with me. I hope we will have a great time during the English interactive lessons. Look forward to seeing you soon!